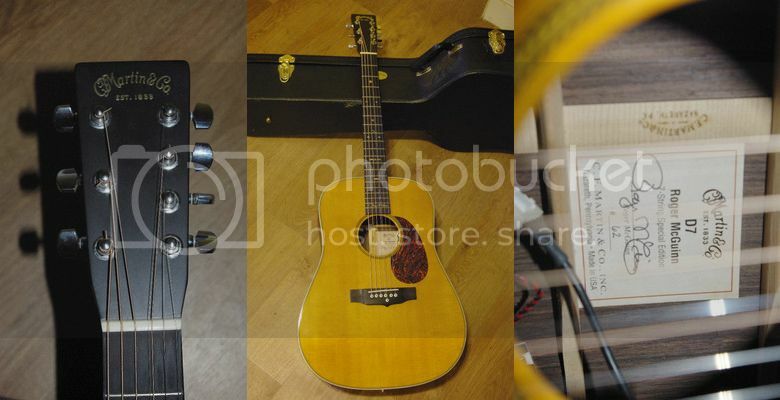 Here we see a Martin model D7, which sadly is now a discontinued model. I say sadly, because it is one of the best ideas - dare I say innovations? - for acoustic guitar to have come along in decades, and like all the very best ideas it is so simple. A signature guitar for Byrds guitarist Roger McGuinn, the D7 aims to capture part of his signature 12-string sound but without the hassle of having a full set of twelve strings. The seventh string is an octave G string which is paired with the regular G string, so this guitar still has six courses and doesn't require any mental adjustments when playing. Roger McGuinn describes this as 'the Swiss army knife of guitars'. It can be strummed, picked, flat picked and has nearly all the zing of a 12 string but the convenience of a 6 string. When finger picked the 7th G string isn't even noticed but when strummed or flat picked it sings out beautifully. Indeed, this guitar was the inspiration for my own 8-string guitar conversion which we looked at recently and which is still playing very nicely - the top hasn't imploded with the extra string tension ... yet!. My original idea was to convert my (cheap) acoustic into a 7-string like the Roger McGuinn guitar, but I started thinking, "If seven strings sound so good, then what will eight strings sound like?" and ending up drilling extra holes in the head and bridge to accommodate an octave D string. This above pictured Martin D7 is currently listed on eBay UK with a starting price of £1,299 and a Buy It Now price of £1,825. Bear in mind, before the guitar was discontinued the new price was £2,250. That is a lot of money, but then this is a quality guitar from C.F. Martin. If you wanted a similar 7-string (or 8-string) guitar, then there's always the Do It Yourself route similar to the one I took, or if you don't want to go drilling holes in your favourite acoustic guitar there is this really neat conversion kit from Netherlands-based AddString which adds an octave G-string to your guitar without any modifications other than filing a extra slot in the nut (and the tool for that is provided in the kit). One very crafty feature is the ability to switch between 6-string and 7-string modes using a string catch mounted in the soundhole. The AddString kit is available now at a special introductory price of $95. Haven't heard it all the way through but it's pretty cool. In the mid-sixties, everyone who was properly fanatical had copies of Koerner, Glover & Ray's "Blues, Rags & Hollers" and "Lots More B,R&H" and "The Return Of K,G&R". Spider John Koerner played a 7 string guitar with an added octave G string. 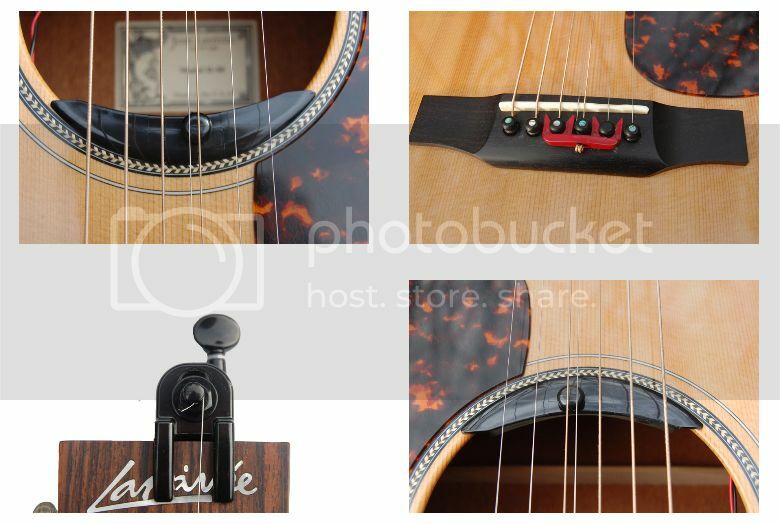 He modified an acoustic by putting a banjo tuning peg in the headstock. It had a great sound and I'm pretty sure that's where Roger McGuinn got the idea, even though he doesn't credit Spider John.